Armor Guard® industrial safety railing is the perfect economical safety solution for separating your people areas – work stations and walkways – from light shop traffic. Gauge – Armor Guard is made of 11 gauge steel and contains 2 ribs per rail. Choose the height of your system. Armor Guard is available in either single or triple high. Choose your rail lengths. Note that rails are measured from post-to-post, on center; actual rail component will be 3″ shorter than the specified length on Armor Guard. Lift-out pockets increase center-to-center dimension by 1″. We will be happy to recommend the products right for your environment. 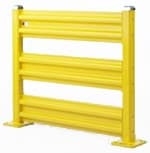 Steel King also carries a full line of safety accessories including Safety Gates, which can be ordered as part of a new installation or retrofitted into an existing system. They’re self-closing and include a hinge assembly on one side of the gate and two gate stops on the opposite side, for hanging in either direction. Many standard Armor Guard® products are available through our 48 Hour Quick Ship program. We also carry a heavy duty line of safety products. Please see our Steel Guard® page for product information.